At the handsome Argentinean estancia with 7500 acres of unblemished wilderness, avid international travelers can enjoy the spectacular countryside, the proud hills and the rural tranquility on horseback, on foot or simply finding sought after relaxation in estancia's lovely gardens. Due to its convenient proximity to historic locations, you can readily visit the attractions of Ischilin, the Fader Museum, Mount Uritorco and the incredible Saint Catherine Jesuit Convent during your stay. The estancia is very cozy and comfortable: The rooms are spacious and bright, with all the modern day conveniences. Open your bedroom windows at dawn and experience the most breath taking views - a truly unforgettable moment for many guests! The large garden here is a magic location; an ideal spot to enjoy a good book or a drink by the pool after a day of riding and exploring the beautiful foreign lands that this region of Argentina has to offer. The culinary experience is enviable: Using the best in regional products, the chef provides delicious and refined country-style fare, served in a well presented, dining room ambiance or as the popular Argentine-style open fire barbecues. You can choose to ride only a few hours per day around the vicinity of the glorious property or opt for the day long horseback treks up into the vast hills and the impressive cliff side. For example, you can ride to Moon Ravine and watch the massive condors fly over the peaks of the cliffs which is quite magnificent. The trails are varied; you will traverse mountainside and meadows, cross rivers and visit the waterfalls. There are even some little beaches hidden in this paradise! Bird watching includes eagles, condors and peregrine falcons and often we may catch sight of foxes, hares, wild donkeys and goats. You can even arrange for the unique night ride under the light of the full moon, visiting Aspero hill and Piedra Parada, if the conditions are right! Whether horse riding or simply sitting back to relax and enjoying the hospitality, the positive energy of the estancia and its surrounding wilderness will transform the body, mind and soul. Riding with us is an experience not to be missed, whatever your ability. The adventure starts in the ‘monturero’, where our staff prepares the horses and the journey begins. Ride through the valley, guided by expert guides and with the best horses and equipment. There are horseback rides for all levels of experience (even for guests without any experience) and durations, according to the preferences of the passengers. We have a variety of horses and a variety of landscapes, that give us flexibility for each guest to enjoy their ride in their own way. From a ride of a couple of hours, to the possibility of riding between the hills for several days, we ensure each guest has a thoroughly enjoyable and memorable experience. Variety of landscapes and trails Through the Ongamira’s clods –warming up! Ideal to start visiting the farmhouse area and getting used to the horses, as a first approach to a future longer ride. A tour around the valley, up to the bottom of the reddish formations that give name to the area. Possibility of climbing one of the clods on horseback to enjoy a breathtaking view. Ascent to a considerably high mountain where you will be able to see all Ongamira and a great part of the farm house, accompanied by the strong breeze, typical of the mountain tops. The setting invites to get off the horse and sit on the old low stone walls to enjoy the landscape. Departs from Dos Lunas. This horseback ride will take you to the highest points from were you will be overwhelmed by extraordinary views of the valley and of the mountain meadows; you will also see the great salt evaporation ponds from the north of Cordoba province. Given the diversity of the landscape’s topography, this ride could be enjoyed at walk, trot or gallop. Once we reach a specific place you will be able to sight the source of the Sauces River where usually the flight of a condor or a great-chested buzzard eagle could be watched. Tour around the farm house, through a path made at the beginning of the 20th century by a Russian engineer. Different landscapes boasting infinite ranges of greens and blues. Over the horizon, the great salt evaporation ponds and a few little towns. The local fauna includes foxes, hares and several bird species. cascade. Ideal to be enjoyed on warm days and to share a picnic by the stream. Climb up the hill on horseback following the path where the Comechingones indians fought their last battle against the Spanish army. Panoramic views of the Ongamira valley and of the farm house. Birdwatching includes eagles, condors and peregrine falcons. On top of the hill, one of the few condor nests outside the Andes mountain range, where condors can be closely seen, mostly on warm days. Parada. Return through Puente de Laja. We do not fix an agenda because we want you to relax, feel at home and tailor as most as possible your experience. Our experienced Gaucho guides will accompany you in every trail! Present in all of South America, the name given to the creole horse varies from country to country: Criollo in Argentina or Uruguay; Crioulo in Brazil, Costeño and Morochuco in Peru; Corralero in Chile and Llanero in Venezuela. This breed is the direct descendant of horses brought to the New World since the arrival of Columbus, imported by Spanish conquistadors during the 16th century. Many of these war horses escaped or were abandoned, and rapidly returned to a more primal state in an environment perfect for their development, the Pampa . Until the beginning of the 19th century, colonial Argentines also used these creole horses, taking what they needed from the wild herds roaming the Pampa. Later they began to import European horses, notably Percherons and Thoroughbreds, which they crossed with the creole.. The Criollo is a medium-length horse, with a powerful body. Size : 1.38 m to 1.52 m (13.2h to 15.0h). Basic riding lessons are available free of charge! 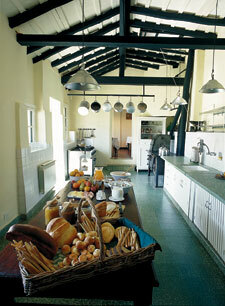 The estancia is very cozy 100-year old restored farmhouse. The rooms are spacious and bright and with all the modern conveniences. Open the windows at dawn to experience the view from the house for an unforgettable moment. The large garden concentrates the magic of the location. It is the ideal spot to enjoy nature after horse-back riding or an afternoon at the pool. Most of the bathrooms are shared – one for every two rooms. Two rooms have a private bath. The culinary experience is unforgettable. Breakfast and tea with home baked bread, fried pastries, croissants, the home made jams of Donna Irene, natural fruit juices and local honey. Using regional products, the chef offers an authentic refined country-style fare, served in a dinning room ambiance which fosters relaxation after the meal. 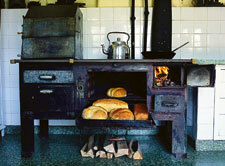 Argentine-style open fire barbecues by the pool or the option of a large picnic basket to take along on the rides.